Evans NPG is the original waterless coolant. NPG is recommended for racing engines that run on tracks or in series where there is a no ethylene glycol rule and can be used in high performance street vehicles with high flow cooling systems. NPG is not recommended for daily drivers or cold weather operation, and may require system modifications to ensure a successful conversion. Original Evans NPG coolant is engineered specifically for all racing series which allow coolants other than ethylene glycol based. For use in drag racing, circle track, motorcycles and boats. 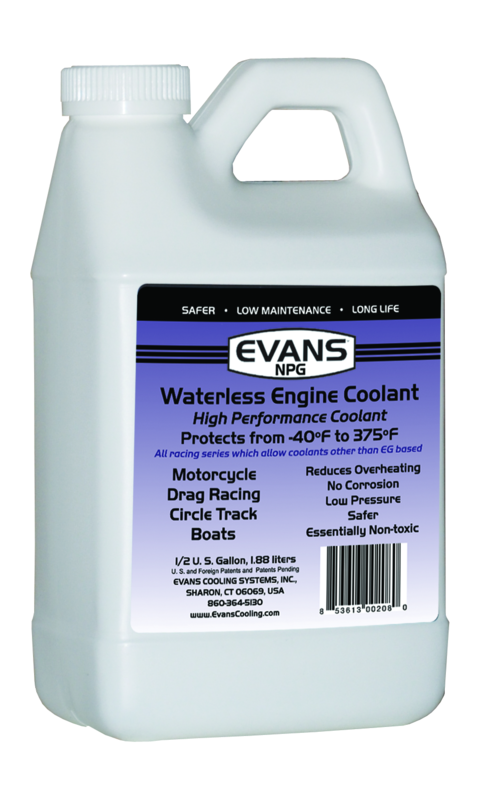 Less Toxic - Evans waterless NPG coolant has low toxicity. NPG waterless engine coolant is recommended for use at race tracks with a no ethylene glycols rule and other special applications. Embedded video for Waterless NPG Engine Coolant Half Gallon Evans Cooling.